TWRP 3.0.0 now available for Android devices – few days back (as of the time of publishing) TeamWin Recovery Project version 3.0.0 was released with new features integrated, new look, improved material design UI and some other minor bug fixes. However, the TWRP 3.0.0 is said to be the most compatible custom recovery for Android 6.0 operating system and any other android future OS. To start with, the TWRP custom recovery is a very useful tool that helps us execute tasks like android rooting, flashing custom roms, flashing Xposed Installer (which lets us tweak dark ends of our device), flashing mods and many more. Installation of TWRP 3.0.0 on your android device is pretty easy… before 5mins, you can achieve this. Simply follow the below guide. Note: Some android device requires an unlocked bootloader before installation of custom recovery can be progressive. 1. Make sure that you’ve downloaded the recommended drivers for your android device on your windows PC. 2. After that, download ADB and Fastboot drivers here. Setup properly on your windows PC. 3. Now, download the TWRP 3.0.0 custom recovery image here. Select the recommended image for your device. 4. Once you’ve downloaded the recovery image, rename it to recovery.img and paste on the ADB/fastboot folder… as seen in the image below. 5. 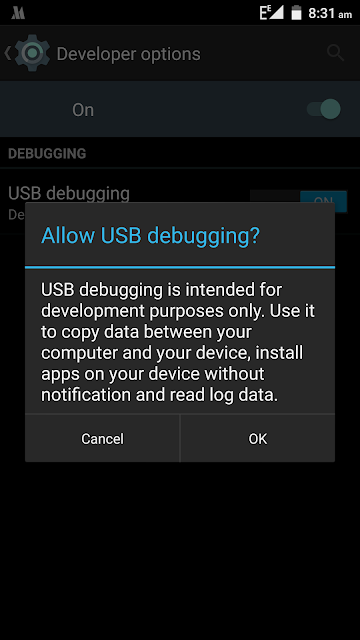 Next, enable “USB Debugging” on your android device. 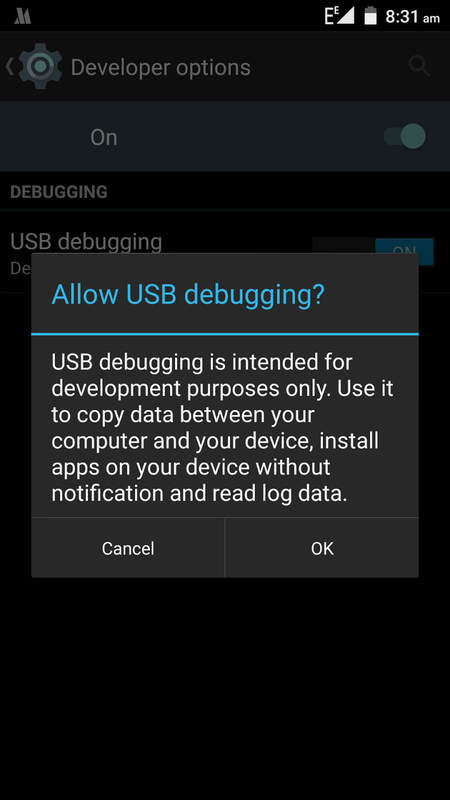 To enable, go to settings >> Developers option and enable debugging. If developers option isn’t visible on your device, simply go to settings >> about phone >> build number and tap up to 8 times, till it shows a message that “You’re now a developer”. Now go back to settings >> developers option and enable. 6. Once you’ve enabled USB debugging, connect device to your windows, and also accept computer’s RSA KEY on your device as seen in the image below. 7. After that, go to the adb/fastboot folder and open command prompt… simply hold shift button on your keyboard, then right click and select “Open command windows here”. 8. 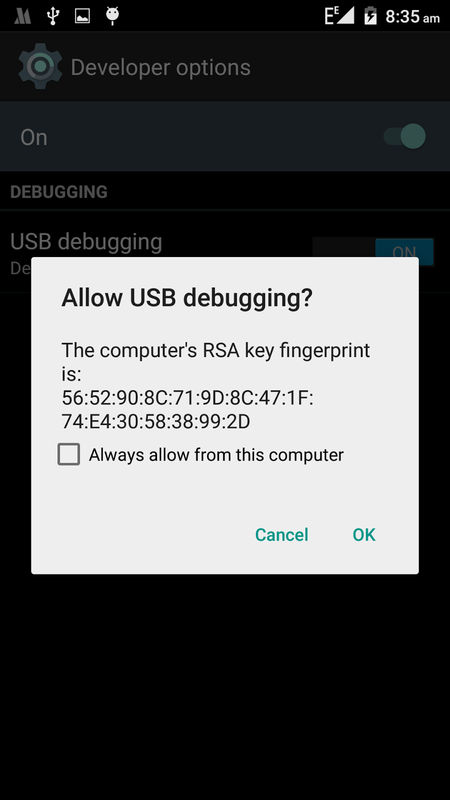 To verify if your device is connected properly, simply input the below command. 10. To reboot bootloader and flash TWRP 3.0.0 custom recovery on your device, simply input the below commands. 11. The above commands will help install TWRP 3.0.0 custom recovery on your android device. Once process is completed, reboot your device, or use command “fastboot reboot” to reboot device. Don’t include the quotes. That’s it… You’re done. If you need any further assistance, please do let me know via comment section.